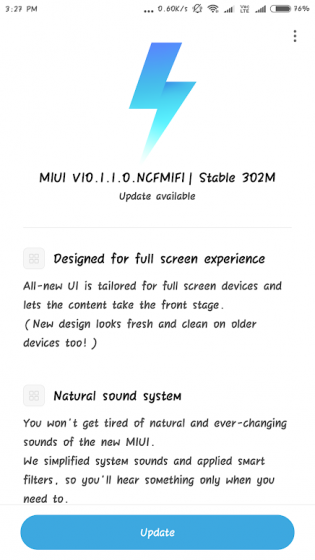 Just a couple days after the Redmi 6 Pro, one of Xiaomi’s most popular phones, the Redmi Note 4, has now started receiving the much-awaited Global Stable MIUI 10 update. The Chinese giant has taken to Twitter to confirm the MIUI 10 stable update rollout and we’ve already received the update on the Redmi Note 4 at the Beebom office. It carries build number v10.1.1.0.NCFMIFI and weighs in at 302MB in size. Xiaomi is already testing Android Pie on some of its device, but this MIUI 10 build is still based on Nougat and it’s quite disappointing. Talking about the features, this MIUI 10 build brings along Pie-inspired UI elements, much improved full-screen gestures, improved stability, a natural ever-changing sound system, and a lot more fun features to the Redmi Note 4. You can check out our list of the 10 best MIUI 10 features, as well as India-specific features if you’re unaware of them. If you haven’t received the OTA update notification yet, which you should’ve received by now, but are eager to get the MIUI 10 Global Stable update, you can jump right into the Settings, head to ‘About phone > System updates’ and hit the Check for Updates button. You can also choose to download the fastboot or recovery ROM right here to flash them on your Redmi Note 4. If you’ve already installed the update, well, how do you like the new MIUI 10 experience? Let us know in the comments below.